It’s funny how looking at baby pictures of your growing kids makes you miss them at a younger age. It also makes you want to have more. There’s nothing wrong with wanting to help build the BlackBerry addicted army of the future is there?! With more and more information readily available to new and expecting parents, sometimes the options on how to raise your children can potentially be absolutely overwhelming. I always wonder how my parents did it. They didn’t have Super Nanny to consult. I wish they did; it might have saved them the multiple trips to the hospital for a certain, accident-prone kid. 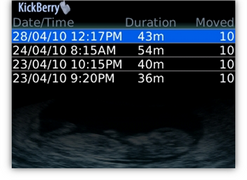 The other day, I stumbled upon BabyBerryApps and their BlackBerry applications designed to help bridge the gap between babies and Berrys. I think BabyBerryApps and I are on the same page; your BlackBerry should help make your life easier, so you can spend more time being a family. Over a year ago, I wrote an article containing suggested, helpful apps for parents – you can read it here. Alicia also put together a list of apps you can use to entertain and educate your children. After the jump we take a brief look at their current app line up. 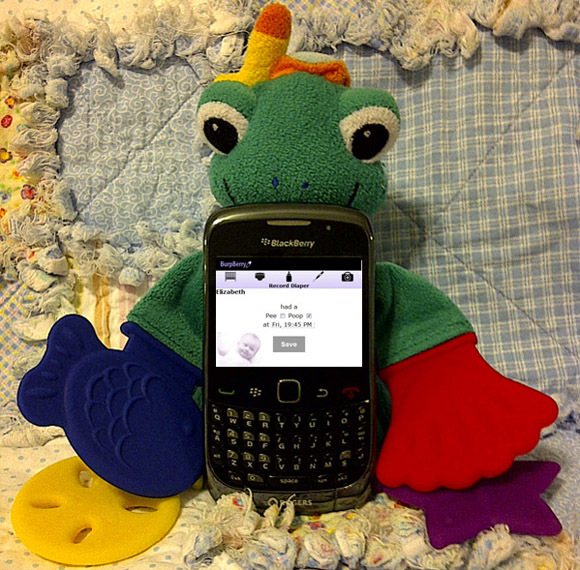 As BabyBerryApps say they cover everything “from fetal movements to contractions to diapers”. The countdown is on! This app keeps track of how long your bun has been baking in your oven; including due date and which trimester you are in. The due date is calculated based on the first day of your last cycle. With so many things to prepare for, being as organized as possible is key. Alerts or reminders can be set up to occur during a specific week or even a specific trimester. To further its simplicity, the application comes with preinstalled tasks to use. I know for some women, it sometimes feels like they have Chuck Norris in the womb. Don’t ask what he’s doing in there, no one questions Chuck Norris. Use your BlackBerry to count how many times your baby kicks (up to 10 times). The app stores records each of these ‘roundhouse’ events. For future evaluation; the timer continues even if you leave the application. For this app, it may be better to have your significant other handle the BlackBerry; you will see why as I continue. The big day has arrived! Your water broke, hopefully not on your BlackBerry, and it’s go time. BirthBerry helps you time your contractions and displays average duration of each, interval and how long you have been labouring for. You can send the information to coaches, doctors, parents or whomever you like. If you’re too exhausted (or even too busy loving your new bundle of joy), the app helps you quickly send out the announcement. If you end up like Octomom, this app handles multiple babies (potentially unlimited). At first, the name of this app sounded like one of those sound effect apps that blasted bodily function… “tunes.” When that bundle of joy comes home, the first little while is often a happy, disorganized time. Your memory quickly fails numerous times and you can’t remember what you did. This app acts a progress list for your day. You can make note of feeding times and details, nap times and positions, temperatures, medication, diaper changes and so on. It covers both start and end times. Lack of sleep causes exhaustion; which in turn causes forgetfulness. This is a great way to remind yourself what made you so busy, and what your baby has been up to. It’s always nice to have some help for the first little while when a new baby is home. If you’re going to raise a BlackBerry family, you may as well start from square one. Besides, your BlackBerry may get jealous, as it’s not getting as much attention as it used to. What better way to show it some love, than by letting it help you out? For more information, check out babyberryapps.com. Don’t forget to hit the CrackBerry App Store to check out some more apps for expecting, rookie and veteran parents.